Brothers, John and Vinny Restivo met Ben Presley while working at an Atlanta, Georgia pizza kitchen but later on, while attending a Cage The Elephant concert, the three would decide to become a band and so became Concord America. 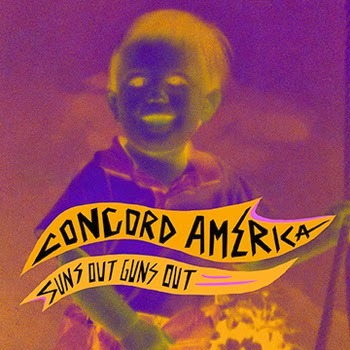 Concord America spits out ragging fuzzy psychedelic garage-rock reminiscent of early Arctic Monkeys only a little louder and a little dirtier. "Suns Out Guns Out" is the first single to their latest EP under the same name which will hit the shelves in May via Post Echo Records. A follow up to their 2013 debut Shag Nasty, Suns Out Guns Out promises more blistering riffs with shout-along vocals that is sure to encourage crowds to churn.